This is the first review from the Publisher Chess Stars at Seagaard ChessReviews. And our first review is a book published seven (7) years ago! 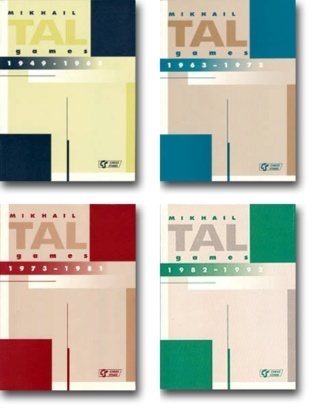 In 1994 the first book out of 4 volumes with all games played by Mikhail Tal was published. The first of these books contains 672 games played from 1949 until 1962. All games are annotated in Informator-style and my guess is that the most of these annotations was made by Sergei Soloviov (Soloviev in the book). I have to guess because I can't figure out how many games the International Grandmasters Khalifman, Kochiev, Kramnik, Makarichev and Sveshnikov annotated. At one of the first pages these Grandmaster are listed because they made the annotations in this first volume, but only at very few occasions I can find the annotaters name after the game! After I wrote this review the publisher (Soloviov) informed me that the annotations was a teamwork, and after this the Chess Editor Alexander Khalifman looked through all the games! After this correction I need to say that this should have been told at one of the first pages in the book! Games: The rest of the book!! The games of Mikhail Tal is what it is all about in this book. No biography, no pictures - just games and Crosstables! In every game collection I feel that the Crosstables is one of the most important things, and the publishers made a very fine work to cover all events that Tal played in. Even the games that could not be found is listed by the result. One thing I missed was which board he played when participating in the Olympiad - the opponent and result is listed but not the board. Now I'm talking about the Olympiad I couldn't miss that the name of one of the greatest Danish players was misspelled! In the game USSR - Denmark at Munich 1958 Tal played against the Dane Enevoldsson according to the book. This is not quite the case, because he played against Jens Enevoldsen and Tal was in fact lucky to get a draw in this game! This game is a typical game from Tal from this period, where he was well on the way to dominate the chessworld for the next 3-4 years. After the great Tal years between 1958 and 1962 he had to struggle with a bad health for the rest of his life (and other things like to many cigarettes...). After 1962 Tal played great chess when he was not sick, but he never came back to the same high level. His stamina was not quite good enough to take him to the highest level again. The book is well organized and I only has one thing to complain about: The Index of Openings and Index of Opponents. The layout is good enough if it was published in a bulletin, but in a book of this quality the Publisher can do better than this. All in all this first book with Tal-games is a very fine collection of the games from the best Tal-years. If you like the games of Mikhail Tal this book is a must buy. Apart from small mistakes that I hope the Publisher correct in the next revised edition, this is a fine piece of work. As promised by the title you get Tal games from 1949 until 1962 - and nothing else! If you are looking for a biography you have to look elsewhere. Had the question been "Who is the best chess player of all time?" Had the question been "Who is the best chess player of all time?" I would have thought and chose one from the likes of Bobby Fisher, Garry Kasparov, Magnus Carlsen, but it asks for my favorite chess player and without any further thoughts, I say, it's The Magician from Riga. 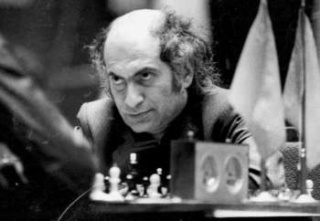 There arec many reasons to why Mikhail Tal is my favorite player of all time, and I would like to list them one by one. I can never get enough of watching his games. His imagination and sheer intellect can make anyone go in shock and awe at the same time. His brilliancy at tactics is what makes him my favorite and the eight World Champion. He is famous for his sacrifices on the board to dominate and win. But there's more to that. In many of his interviews, he said that sometimes his sacrifices were accurately calculated, and sometimes they were purely intuitive. But there's more to that. Mikhail Tal made sacrifices not to win, but to enjoy the game. In the following game, he sacrificed his Queen, with no gurantee of winning, only because he wanted to enjoy the play. Only someone who truly loves the game can do that. He also quoted "To play for a draw, at any rate with white, is to some degree a crime against chess." Use this website to convert djvu files to pdf. Just follow the instruction and you can download the pdf. "https://www.djvu-pdf.com/"